Petrol and diesel are both made from oil - a black, gloopy substance formed from the fossilised remains of animal and plant life that lived and died under our oceans hundreds of millions of years ago. Oil contains compounds of carbon and when it’s burned in a car’s engine, along with being an energy source, it produces carbon dioxide (CO2), the most abundant ‘greenhouse gas’ in our planet’s atmosphere. The concentration of CO2 in our planet’s atmosphere has been increasing rapidly in recent years, and now stands at over 400 parts per million, while in 1800, it was at just below 283 ppm. The increased level of CO2 in our atmosphere, brought about by increased burning of fossil fuels, is now agreed by almost all climate scientists to be the cause of rapidly accelerating climate change and rising global average temperatures. 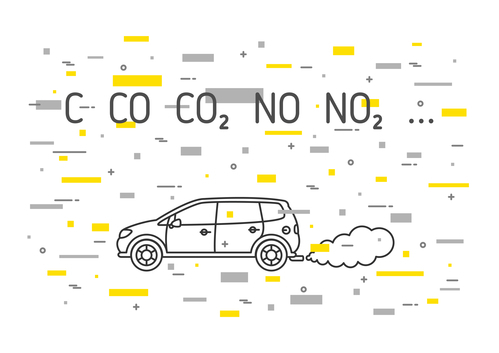 But what’s also now becoming much clearer is that diesel cars, which in the 2000s were hailed as more environmentally friendly than their petrol counterparts because they produce less CO2, also produce far more NOx - oxides of nitrogen. These include nitrous oxide (N2O), or ‘laughing gas’, which is almost 300 times more powerful a greenhouse gas than CO2; nitrogen dioxide (NO2), which is a major pollutant and forms the brownish coloured component of smog; and nitric oxide (NO), which readily oxidises in the atmosphere to become nitrogen dioxide. New rules to control pollutants in emissions have led to cleaner, more efficient engines. But as the VW emissions scandal of 2015 (or ‘Dieselgate’) showed, in some cases, new and supposedly greener cars are actually only cleaner when undergoing test conditions. Wider analysis of vehicle emissions has shown that many cars from a range of manufacturers actually exceed emissions limits by a large margin when being driven in real life, rather than under test conditions. So it makes sense to look to alternatives to petrol and diesel powered vehicles. And fortunately, alternatives already exist in the form of all-electric and electric-petrol hybrid vehicles. About one in 200 of the new cars sold today are fully electric. There are around 90,000 of them on the UK’s roads today. It is predicted that by 2030, this will have increased dramatically to around one in 12. But all-electric cars run on big batteries and of course those batteries need charging. And whilst hybrids use batteries to provide some of the power, they still use a petrol engine to provide some, or in some cases most of the power to drive the car. So just exactly how clean are they as alternatives to petrol or diesel cars? Read More: What are the downsides to electric cars?